At Landmark College, we are proud to honor the student athletes who have excelled on and off the field or court. Congrats to all of our athletes and coaches for a fantastic 2017 – 2018 sports season. The following athletes received top honors during our 2017 – 2018 Athletic Awards Ceremony. 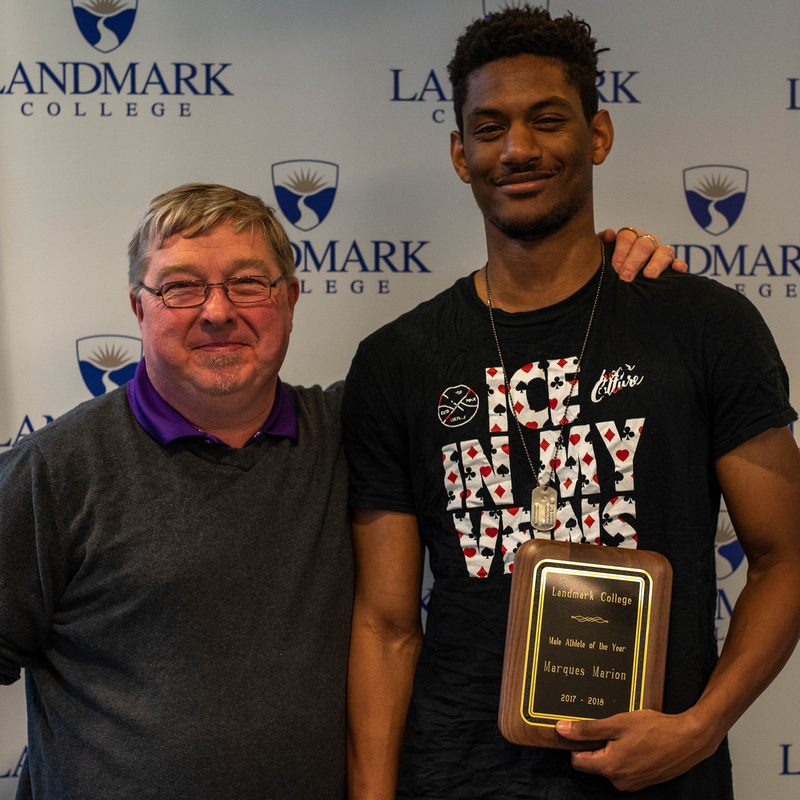 Student athlete Marques Marion, who plays both basketball and baseball for Landmark College, was named 2018 Male Athlete of the Year and also presented with the 2018 Jim Austin Integrity in Sports Award by baseball coach John Wood. Baseball coach John Wood also presented basketball and baseball player Will Mauch with the 2018 Scholar Athlete Award. Gus Zarefsky was honored with the the 2018 George Noble Dedication to Team Award for his hard work and dedication to baseball. Softball and basketball player Inna Broadbent received the 2018 Female Athlete of the Year Award, presented by softball coach, Ellen Wood. Team awards are visible on the tab below. To view photos from the awards ceremony please visit the Landmark College Athletics Facebook page. Any member of the Landmark community may submit an award nomination. Links to nomination forms are below. Nominations are due by 4 pm on April 8, 2018, except Hall of Fame nominations which must be received no later than March 4, 2018. No late or incomplete nominations will be accepted. The committee will review all nominations and make recommendations regarding award winners to the Direector of Athletics, Fitness, and Recreation. The final decision of Hall of Fame selections rests with the President. Male Athlete of the Year—Awarded annually to a male student athelte who exemplifies the highest level of talent, skill, and commitment in his sport(s) as well as exemplifies respect, integrity, teamwork, and leadership on and off the field or court. He must be enrolled at Landmark for at least one academic year and be in strong academic standing and free of student conduct issues. Female Athlete of the Year—Awarded annually to a female student athlete who exemplifies the highest level of talent, skill, and commitment in her sport(s) as well as exemplifies respect, integrity, teamwork, and leadership on and off the field or court. She must be enrolled at Landmark for at least one academic year and be in strong academic standing and free of student conduct issues. Scholar-Athlete Award—Given annually to a student athlete who demonstrates exemplary academic performance while maintaining a high level of commitment in the athlete arena. Additionally, they must demonstrate a high level of commitment to academic attendance and academic support. George Noble Dedication to Team Award—Awarded to a student athlete who has gone above and beyond in their passion for sports. They are a role model for their peers but may not be an obvious leader. This idividual displays quiet leadership in and out of the athletic arena with little pomp or circumstance. This award is not given annually. Sports Leadership Award—Given to a student athlete who has gone above and beyond in their display of leadership abilities in and out of the athletic arena and beyond. He or she must demonstrate a high level of respect and integrity in all of their endeavors. This award is not given annually. Jim Austin Integrity in Sports Award—Given to a student who has made a positive impacton Landmark College Athletics through their integrity and commitment. This award honors the importance of fair play and teamwork in and out of the athletic arena. This award is not given annually. Hall of Fame Induction—Rarely given, this award is the pinnacle of athletic achievement at Landmark College. Any member of the Landmark community is eligible for induction into the Hall of Fame. Fair play, leadership, dedication, effort, integrity, and talent are qualities in which a nominee must excel to be elected. Winners will have made an impact on athletics, campus life, and the greater Landmark community. Faculty and staff must not presently be employed by the College and student nominees must be an alumnus for a minimum of five years prior to nomination. Landmark College students learn to become leaders.